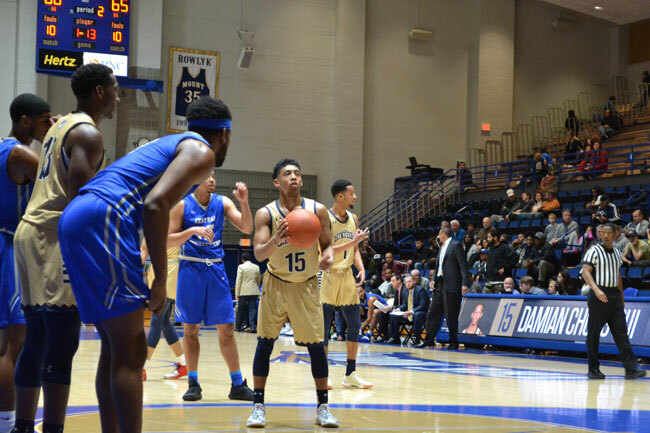 With a little more than half the season in the books for the Mount St. Mary’s men’s basketball team, it’s time to take a look at the season as a whole thus far. The team’s sub .500 record may be deceiving for the time being, with the strength of schedule heavily weighted at the beginning of the season; however, there is plenty to look forward to for the Mount throughout the rest of the season. Mount St. Mary’s has just broken into its most important stretch of games, though, taking on a fleet of in-conference opponents in the coming weeks, where wins are as valuable as gold for the Mountaineers. While playing just a handful of conference opponents so far this season, the Mount has played promising basketball and displayed flashes of what could make them a consistent machine on the court. The Mountaineers picked up their first conference win Saturday, January 19 against Wagner College, defeating the Seahawks in enemy territory for the first time since 2014. The Mount has been getting solid contributions from freshmen Vado Morse and Damian Chong Qui, who are both averaging over 13 PPG (points per game) so far this season. Another spot of positivity for Mount St. Mary’s is the team’s 3-point shooting, which has been the bread and butter for the team in building leads in games. The Mount cruised to a 16-point lead in the first half against conference opponents Central Connecticut, thanks to some stellar shooting from beyond the arc. Sustaining that shooting consistency for the entirety of the game has been a struggle, though, as the team fell off in the second half, ultimately dropping a close game to the Blue Devils. There are still plenty of positives for this Mount St. Mary’s team to take away from the season. With the youth of this squad beginning to shine, it is only a matter of time until the routine and consistency becomes a staple for this squad, as the players continue to develop into a cohesive unit. In the midst of a long home stretch for the Mount, the team looks to continue racking up wins in Knott Arena, but improvement on the road will be key for the Mountaineers going forward. Home court advantage has been a major factor for the women’s basketball team this season, posting a positive win record playing in front of the Emmitsburg faithful. The energy from the crowd has powered the Mountaineers to post up 80 points three times this season at Knott Arena, with all three of those games resulting in a win. The Mount has understandably not fared quite as well on the road, winning four of seven games outside of the team’s home court, with several of those losses at the hands of high-caliber opponents like Michigan University and Virginia Tech. With the conference games just kicking off, the recipe for the Mount is the same. Stacking wins in close games against conference rivals is a must if the team hopes to make a postseason push in the final few weeks of the season. The women’s team sports a dynamic threat of youth and veteran scoring, giving the team balance throughout the lineup. Senior guard Juliette Lawless leads the team averaging nearly 18 PPG, with freshman Michaela Harrison and Sophomore Daly Sullivan following with 11.3 and 10.8 PPG, respectively. With just a few weeks left in the regular season, the team is going to be relying heavily on its star players to continue performing night after night to keep the wins rolling in. Limiting defensive mistakes and capitalizing on the team’s strong 3-point game has worked for the Mountaineers so far this season, with five players clipping above 30 percent, and three of those shooting 36 percent or better. The team’s upcoming stretch of rivalry games will prove to be the defining portion of the Mount’s season. In the coming weeks, Mount St. Mary’s faces off for the second time this season against Wagner College, Saint Francis University and Robert Morris, where the Mount will look to put some distance between themselves in the conference standings. Guard Damian Chong Qui added 11 points and a team-high seven assists in the team’s loss to Central Connecticut.